When the jobsite extends for miles, and waterproofing is needed on all surfaces, it’s clearly no ordinary project. Man-made tunnels have existed for thousands of years, and nearly all of them have used some sort of water handling system. In the early days, steam pumps were used to keep mine shafts dry. Today, membranes are usually used to keep water from entering these below-grade passageways in the first place. The Beijing #5 subway line (Lead Photo) was bored deep below the city streets. 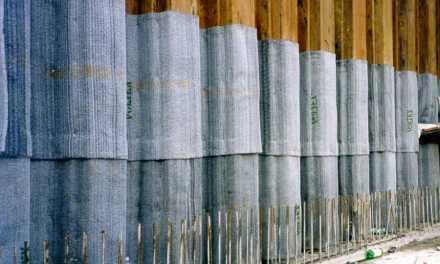 It was waterproofed using Cetco’s bentonite-geotextile membrane placed between the tunnels shotcrete lining and the cast-in-place finish. 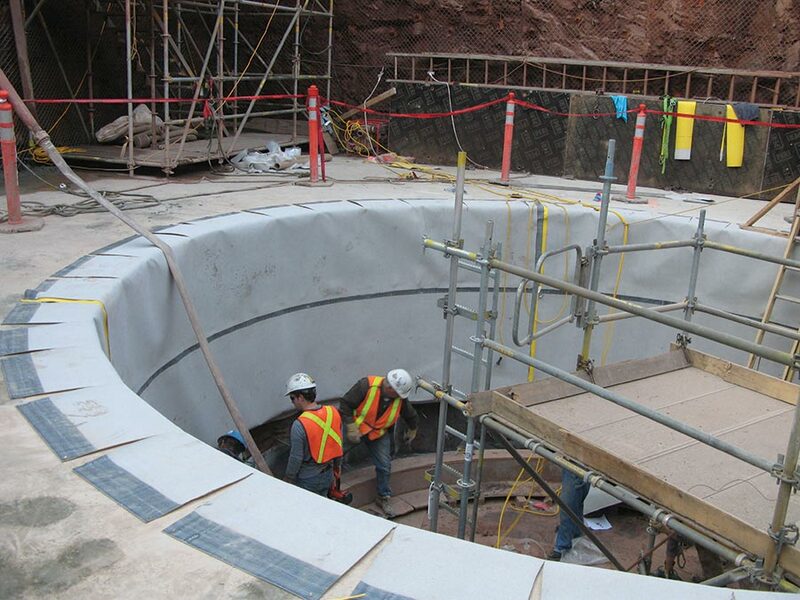 Occasionally, waterproofers use thermoplastic membranes in tunnel work, such as the top of this mine shaft in Canada. 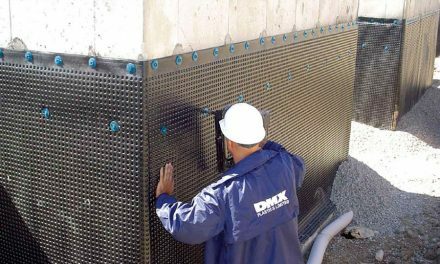 All seams and overlaps are welded to ensure a continuous, unbroken layer of waterproofing. Rigid PVC waterstops are often added at the seams and fused to the membrane to confine any leaks that may occur. 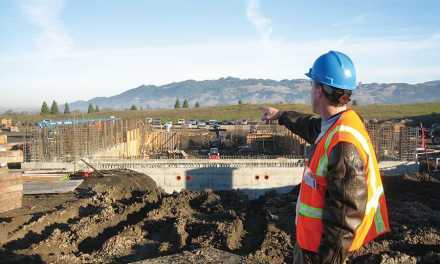 Excavation depth, the soil type, elevation of the water table, and site access are also issues. 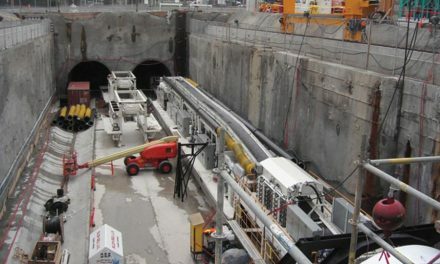 Dave Polk, owner of Epro Services, has been involved with a number of complex tunnel projects, including the underpass tunnel leading to the San Jose Airport. Over one million sq. 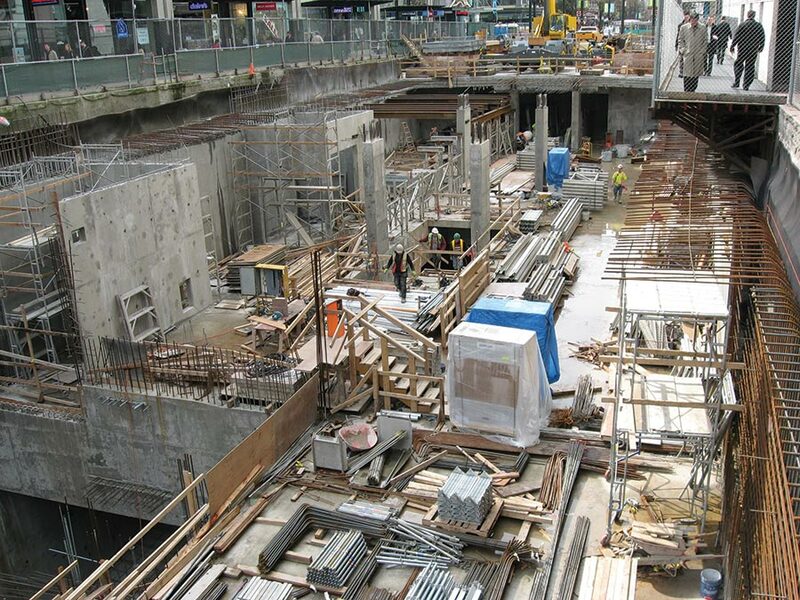 ft. of waterproofing was used on the subway stations of Vancouver, B.C.’s Canada Line, which runs for nearly 35 miles below the city. Site conditions were difficult, to say the least. Spilled jet fuel had contaminated the soil and water in the area, and the water table was only six feet below grade. That meant that even the top of the tunnel would be below the water table. “The first thing that needed to be done was the installation of construction wells and pumps—a site dewatering system,” says Polk. “They built the top of the tunnel first. They drove pilings in, then poured corbels and reinforced concrete beams on that. Once that was is place, we could waterproof the top.” By finishing the top first, surface roads could be opened sooner and minimize the traffic disturbance. The Washington D.C. Blue Line tunnel is an excellent example of cut-and-cover construction. More than 1.3 million sq. ft. of Voltex DS, a bentonite sheet membrane, was applied to the walls and floor, the top was sealed with rubberized asphalt. Then they began excavating under the roof, installing post-tensioned tiebacks as the work progressed to keep the pilings stable. The contaminated soil was removed and a base of structural, permeable fill was brought it. This was covered by the waterproofing membrane, which Polk describes as a “field composite laminated barrier.” Basically, it’s a seamless, spray-applied membrane sandwiched between two layers of HDPE. The tunnel bottom has to withstand 20 feet or more of hydrostatic pressure, so the waterproofing system here was absolutely critical. The wall waterproofing was done blindside. Polk’s crew first applied a dimple drain sheet, then carefully sealed around the tiebacks and other penetrations. They tied this into the top and bottom waterproofing systems, then sprayed a final layer of waterproofing on the walls. Then it was enclosed in shotcrete. “We waterproofed all the way around the tunnel, plus the three sides of the entry and exit ramps,” said Polk. The job was completed several years ago, and so far, hasn’t suffered any water penetration. Byrd, at Cetco, was involved with a massive project in China a few years ago. The excavation was done with an enormous tunnel boring machine (TBM). The St. Louis Metro-Link used a bentonite membrane on walls and a butyl rubber on precast roof sections. Typically TBM tunnels are demanding construction projects. Byrd says it’s not unusual for TBM tunnels to reach depths of 160 feet below the surface. According to Byrd, drainage layers are typically absent in deep tunnels, as the pressures are so great that engineers shy away from anything compressible outside the tunnel walls. Instead, some tunnel designs incorporate a PVC waterstop welded to the interior surface of the thermoplastic membrane in a grid pattern, which limits the distance water can migrate behind the membrane. An alternate thermoplastic membrane product incorporates an active polymer core layer that self-seals at installation defects in the thermoplastic membrane to stop water ingress. Entire pre-cast tunnels like this one in Stamford, Conn. are becoming increasingly common. 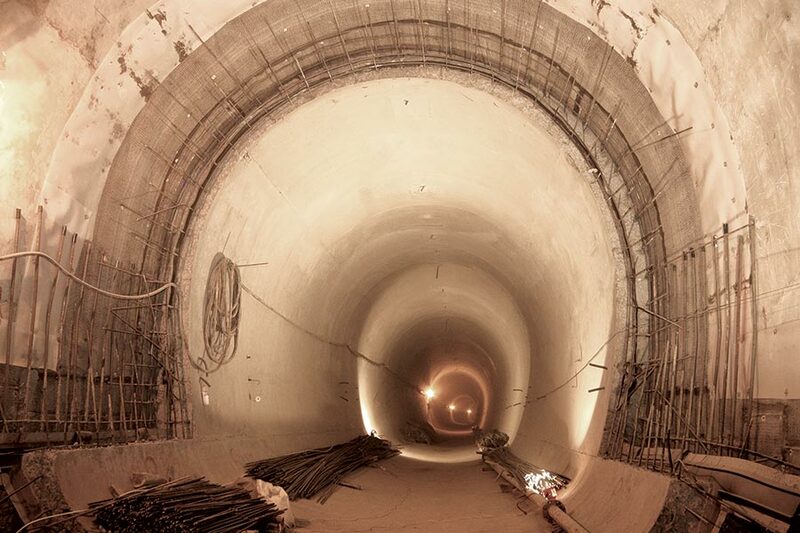 This system of drains and pumps is often used when the sheer scale of the project prohibits lining the entire tunnel. For instance, Dave Polk was tapped to waterproof the Canada Line, a series of subway tunnels around Vancouver, B.C., that extend for nearly 35 miles. “Obviously, they didn’t have the budget to waterproof the entire 35 miles of tunnels,” says Polk. “We only waterproofed the stations, and the tunnels immediately adjacent to them.” Still, just that portion came to over a million sq. ft. of waterproofing. “The soils at most of the sites has strata water, like little springs that come out of excavated walls. The tunnels were trenched and shored with soil nails and shotcrete slurry coats. 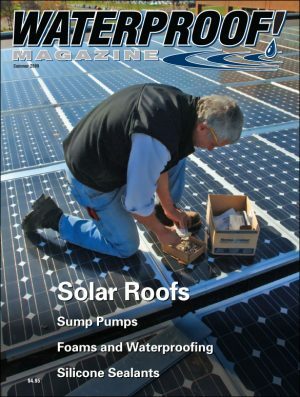 We installed a drainage composite on walls, and a spray membrane on the roof. The only waterproofing on the underslab was in about a third of the locations, where there was strata water,” explains Polk. On this job, they installed the underslab barrier first, then waterproofed the walls, and finished with the ceiling. “With a lot of the cut-and-cover tunnels and shallow earth tunnels you will get into situations where you want drainage,” agrees Byrd. 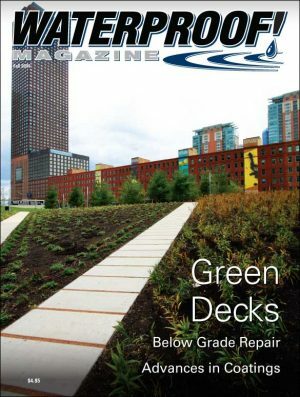 In St. Louis, on another cut-and-cover job, they also used a bentonite sheet on the walls and underslab, which was constructed with cast-in-place concrete. The lid of this tunnel, however, used pre-cast sections. The arched precast tunnel roof was waterproofed with an adhered bentonite-butyl rubber membrane that tied to the bentonite-geotextile membrane used on the wall. Byrd notes that precast concrete is becoming more common in tunnel construction. 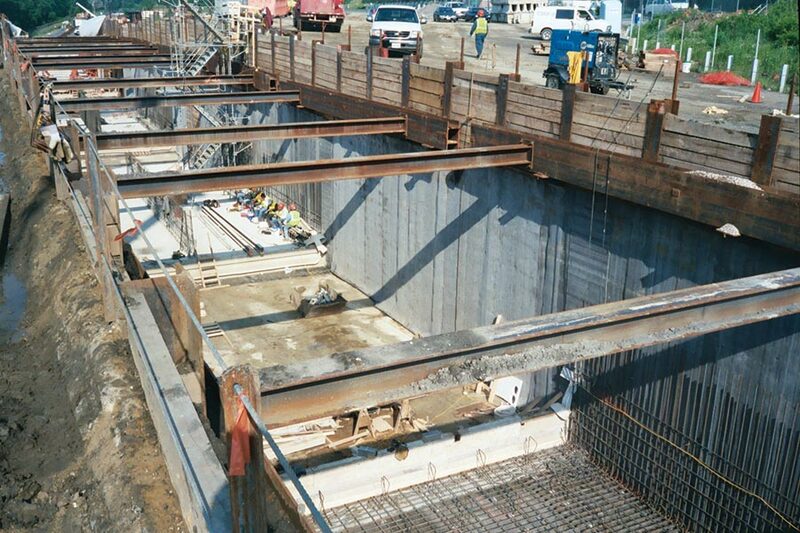 Many small shallow tunnels like utility corridors are constructed using craned-in-place precast sections. 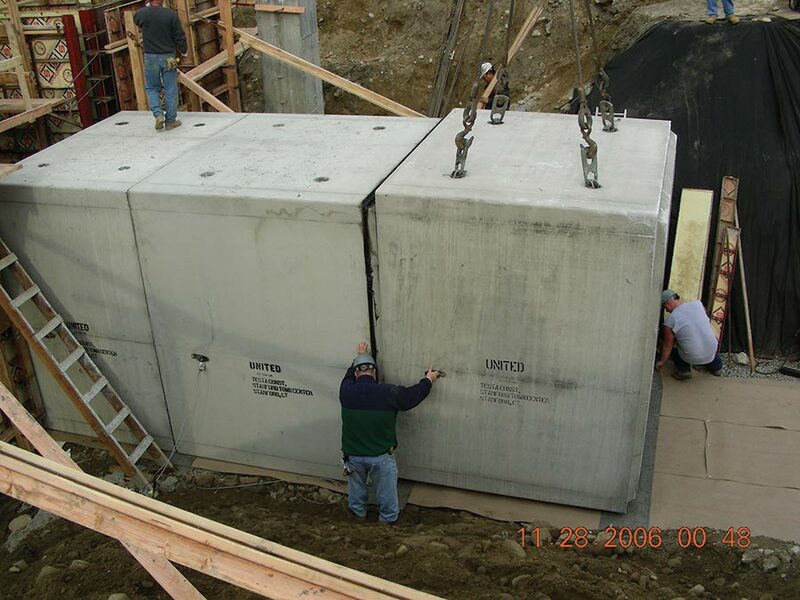 One of the primary challenges with waterproofing these precast tunnels, claims Byrd, is ensuring the membrane is not damaged and stays in direct contact with the bottom of the precast section when they are set into place. 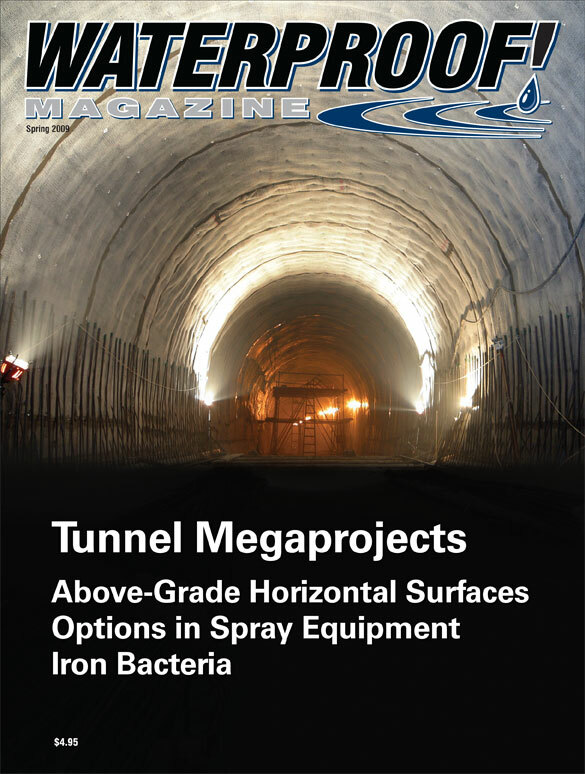 Whether it’s a precast utility tunnel, a cut-and–cover rail line, or a gaping passageway bored deep beneath a mountain, all tunnels need some sort of dewatering system. And that’s helping keep companies afloat in a troubled economy. “We’ve found that because residential has gone down to nothing, the waterproofers that have survived have branched into commercial, usually some type of specialty commercial,” says Polk. Spray equipment is standard for every waterproofing contractor. Whether you’re looking to upgrade existing equipment, or simply become more efficient, here’s what you should look for. Tunnels are typically a massive job for waterproofers, sometimes presenting literally miles of passages that needed to be sealed. 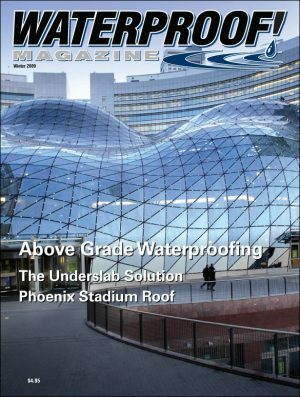 Parking garages, plaza decks, rooftop terraces, and balconies require specialized waterproofing solutions that can withstand wear, abrasion, and corrosive chemicals.